I love the polkadots and the nave blue/brown combination. Admittedly, I don't watch Gossip Girl, I don't really watch TV at all to be honest. However, I've been told by multiple people to watch Gossip Girl, so maybe I'll give it a try? I would recommend it! In the very beginning I didn't want to watch it either cause the title sounded so girly and airhead-y but the storylines are actually really good! It's basically about a couple of rich families in fabulous outfits, involved in lots of of drama, blackmailing, scheming, backstabbing, cheating. Love it! Laura I'm loving every single outfit you wear!! It's insane!! Gossip girl: I've tried watching but it's seems just too vain and unreal to me. Blair is a fashion icon. The outfit she uses are so lovely and I also loved her high-school era. Now in college she is more...classic. (it's like I am talking about a real girl) But still..I love to be inspired sometimes by her classy style. Yeah, i noticed the headbands are gone and she's now wearing amazing designer dresses. I think the 'new look' is even more envy-inducing. believe me, you look even better than Blair Waldorf! especially in the late seasons of Gossip Girl. love the mix between polka dots and the flower print (is it flower print??). I'm not a fan of that show but the styles are great for sure! You look so darn adorable! I love the subtle mix if prints and classic cardigan. I love your translation of Blair! The bag, the shoes, the sweater... Fantastic. 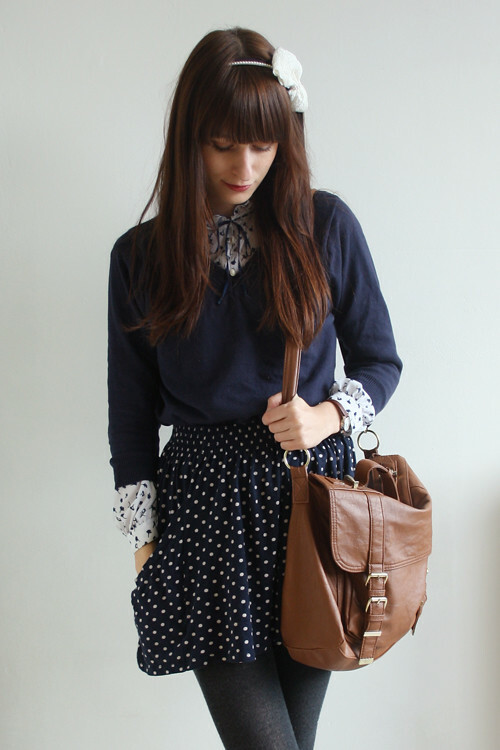 I love navy, and I especially love your navy polka dot skirt! I'm obsessed with GG! and your outfit really looks like a Blair one!!! I prefer Serena's style for me! bello! ho la tua stessa gonna di Zara, stesso colore, mi hai dato una bell'idea per indossarla! nice! I have your same skirt of Zara, same color, you have given me a great idea to wear it! p.s i love that you create a stunning look out of such a budget. It proves that you can find lovely things anywhere if you look hard enough x hivennn. You look too sweet to be a Blair, though! Love this look. This outfit is precious! Love the mixed spots. I love this outfit. I agree that I would steal nearly all of Blair's clothes. I like your polka dot skirt. Simply adorable! I love your handbag satchel ! We love Gossip Girl and often find ourselves channelling our inner Blairs and Serenas. Even though they wear mostly designer brands it's fun to create similar highstreet styled outfits. Fond your blog via Teen Vogue and love what we have read so far - we will definitely be coming back for more! 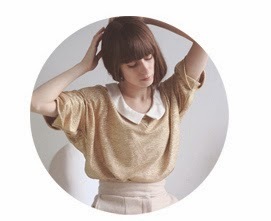 http://www.thewardrobewars.blogspot.com - take a look if you get a chance, we'd really love your feedback.